You've reached the personal homepage of Jimmy Petersen — programmer / musician / robot builder (not quite as cool as Buckaroo Banzai but then again I don't think I'll be fighting off aliens from the 8th dimension any time soon). 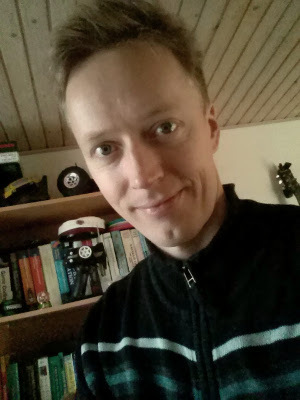 I was born in 1977 and I hold a bachelor's degree in computer science from the Department of Computer Science (DIKU) at the University of Copenhagen. I work as a programmer for the Technical University of Denmark (DTU). My life with computers started with a Philips VideoPac G7000 (AKA Magnavox Odyssey2 in the US) and went on to a Commodore 128 (mostly run in Commodore 64 mode). From there it got to a Commodore Amiga 500 and then later to a Commodore Amiga 1200 until it finally reached the PCs in the form of a 486 DX2 66 MHz. From there on it has been one PC after another and endless upgrades of motherboards, graphics cards, sound cards etc. Since around 1990 I've been experimenting with composing music using what is known as trackers. I started out using Startrekker on the Commodore Amiga and then switched to NoiseTracker also on the Amiga. Eventually I ended up using ProTracker for the remainder of my Amiga music compositions. When I switched to PC, I also switched to using FastTracker 1 using the PC speaker (I actually composed two whole tunes on that setup! ), which was later followed by FastTracker 2 using a SoundBlaster AWE32. After several years of not doing much tracking since FastTracker 2 would not run on my new Windows, I discovered Renoise and Virtual Studio Technology (VST) and this is what I use today along with my Epiphone Special II guitar and my Røde NT2-A microphone and some gear for hooking those up to my computer. After competing in a robot competition held at DTU using only LEGO MINDSTORMS (Robotics Invention System), I got fascinated with how the other participants had made their own electronics for their robots, and I started learning about electronics myself. I'm at the point where I design my own custom made printed circuit boards (PCBs) and produce them at home with a fairly good quality result. I use Atmel's Tiny26 and Mega8 micro-controllers from the AVR family of micro-controllers. The robots themselves are still made mostly out of LEGO. Check out my robots page. This web site is built using Ruby on Rails and is hosted on Heroku. Since I personally use Mozilla Firefox for browsing the Internet, this site is mostly tested on that browser. If you're on Google Chrome, you should be just fine, but if you're on Internet Explorer you might experience strange layout artifacts or be missing CSS3-stuff like text shadows, color gradients, shadows and "icing" like that. I recommend installing either Firefox or Chrome.